Andy and Callum freshen up the floors in the eastern half of Structure One. For Structure Fourteen the end is nigh, or so we are told. 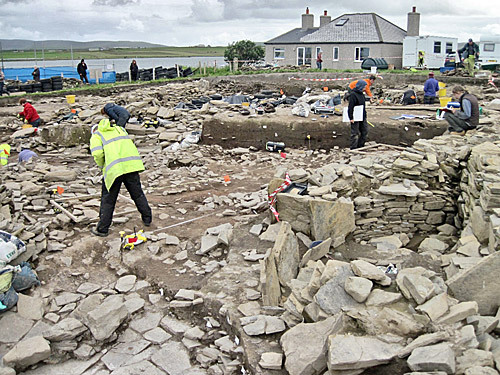 This would be a momentous event because the complexity of the Ness of Brodgar structures means that excavation has to be slow and careful and to actually excavate a building to completion would be a considerable achievement. And so, what this actually means is that most of the work has been done and the main sequence of the floors is now understood. There are, however, some orthostatic slots still to be defined and the hints of earlier floors which are beginning to appear need explanation. Indeed, there are lurking suspicions that there may be an intermediate structure lying between Structure Fourteen and the much earlier structure beneath, which was glimpsed a year or so ago. Which leaves us with the question . . . is it feasible to call “time” on any structure? Perhaps not. All is quiet in Structure One and at least 24 hours have passed since Chris Gee found his last incised stone. This is remarkable in itself, but there are 60 minutes of digging left as we write, so anything can still happen. Chris and Alice start to plan the rubble spreads in the Central Midden Area. In the Central Midden Area, the removal of the last major episodes of midden deposition has revealed the large spreads of rubble associated with the demolition of the south end of Structure Eight and the building of Structure Ten. Still obscured, however, is Structure Twenty-Three, not previously mentioned in the diary because (to the diary at least) it is not clear whether it exists or not. Beginner’s luck! 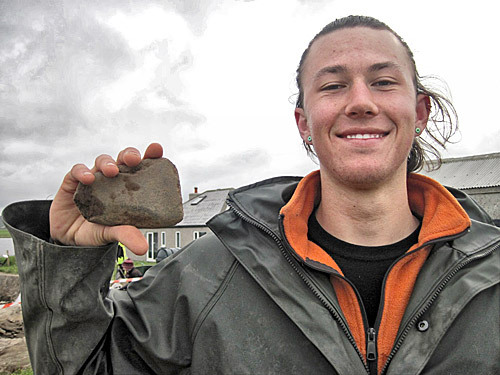 Miles seems happy with his polished stone axe. To the north, Jo has removed the last of the “Smart Fauna” bone spread and the remainder of the midden baulk will now also be removed to allow the remains of Structure Eight to be seen more clearly. There are, however problems persisting. Some of the elements in this area don’t quite relate to the established phases of Structures Eight and Ten. It is evident that quite a large area was cleared for the building of Structure Ten but there are signs that secondary activity, squatting if you like, still continued in the south end of Structure Eight. In Structure Twelve, Mai and Seb are finishing planning the area inside the north door to the annexe and will soon move their efforts to the north-western cell, where there is a blocked-up entrance. This will allow a large area of the interior to be cleared of remaining rubble and for the very late occupation floors to be revealed. Hugo and Mike display the bright-red, dressed-sandstone block from the robber trench on the south side of Structure Ten. In the south end of Structure Eight, Sam, having finished taking samples, is cleaning that area of the very ugly hearth which sits there, glowering at the contrasting beauty of the stones in the walls and piers. This is his last day but we will see him again, perhaps during the winter, when his Phd project is well under way. We cannot ignore Structure Ten in this comprehensive report. Two significant finds have emerged today. In the robber cut, on the south side of the structure, Miles unearthed a handsome polished stone axe made of hornblende gneiss with biotite. This seems to be an interesting example of stone robbers throwing objects into their backfill when the robbed stones have been removed. Not far away, Mike discovered a magnificent red sandstone block, which may have been part of a dresser within the building or enhanced the original inner wall face. We can’t finish without thanking the many visitors who flock to the site and particularly, today, Raoul who travelled all the way from Mexico because he became interested in the archaeology of Orkney and the Ness. He has just one day here before he returns, so we wish him safe travelling. The elusive Tansy — finally caught to write today’s blog. 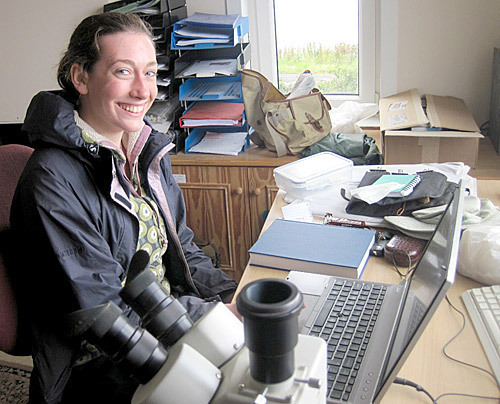 My name is Tansy Branscombe, and, as was so kindly pointed out by Sam yesterday, I have managed to avoid writing a blog for five years now, since starting at the Ness back in 2011. I am told that this must mean I have many exciting tales to relay, but I fear my literary skills may not do justice to all the good times I have had on site. I have recently finished my second year studying archaeology down in Cambridge, but had the good fortune to start on the Ness, in 2011, when I turned 16, after my family moved up to Orkney in 2009. My first experience at the site was back in 2010 though, when I joined the World Heritage Site ranger team for a “Dig for the Day” event. It’s funny to see a new horde of young archaeologists back today, and to think whether they might also be back in years to come! Finds assistant Michael cheers up everyone’s day with a fine selection of homebakes. I have spent most of my time at the Ness working in Structure Twelve. In my first year this was barely uncovered, but since then the trench has been extended, and we are now coming down on to the beginnings of floor deposits in most of the structure. We have been preparing a sampling grid ready for the removal of these layers, and will hopefully soon have several baulks in place that will be reminiscent of what has been done in Structure Fourteen. This year, I am working in the South end of Structure Twelve, where a series of burnt deposits and cut features have proved somewhat puzzling. There is debate as to whether a bright orange layer just outside the southern hearth represents in situ burning, which can hopefully be resolved through analysis of the recently taken archaeomagnetic samples. As part of our attempts to unravel this area, we have also been looking at the south-west corner of Structure Twelve, where we have removed several roof tiles and paving slabs, including one very large, and quite finely dressed, example. The removal of these has allowed us to see a series of small cut features which may indicate that a series of orthostats once stood in this area. I shall now return to the trench, where we excitedly await the return of veteran supervisor Jim Rylatt, but perhaps you will be hearing from me again in another five years! Until then.